Appledoodles - Snickerdoodles with an apple surprise! ~ Learn, Live, and Explore! 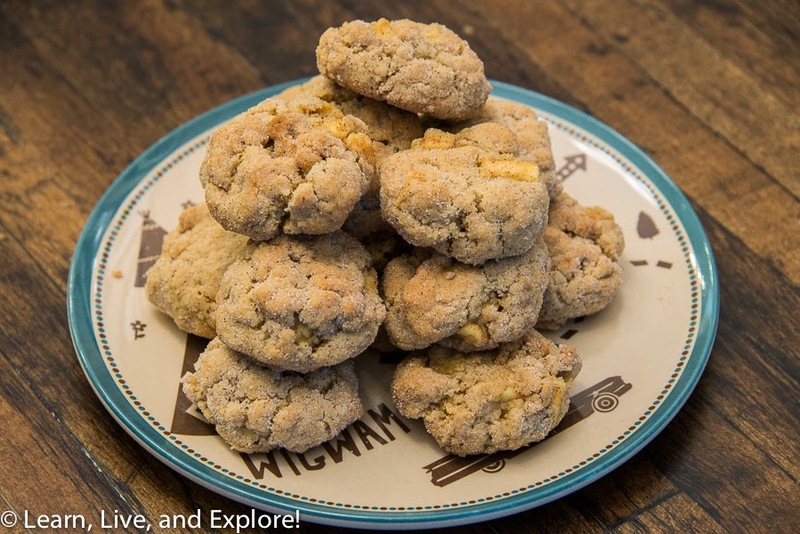 Appledoodles - Snickerdoodles with an apple surprise! I don't know how I stumbled upon this recipe for an apple enhanced snickerdoodle, but I sure am glad I did! I was a little worried because I haven't used instant pudding powder in a recipe before; and when the cookies were baking, they didn't spread as I expected. But, then I remembered how when I bake my Peanut Butter Kiss cookies, I have to press and flatten the balls down right out of the oven before adding the kiss, so that worked with these cookies as well. I can tell you this much, regardless of how they look with or without the flattening, they taste delicious! 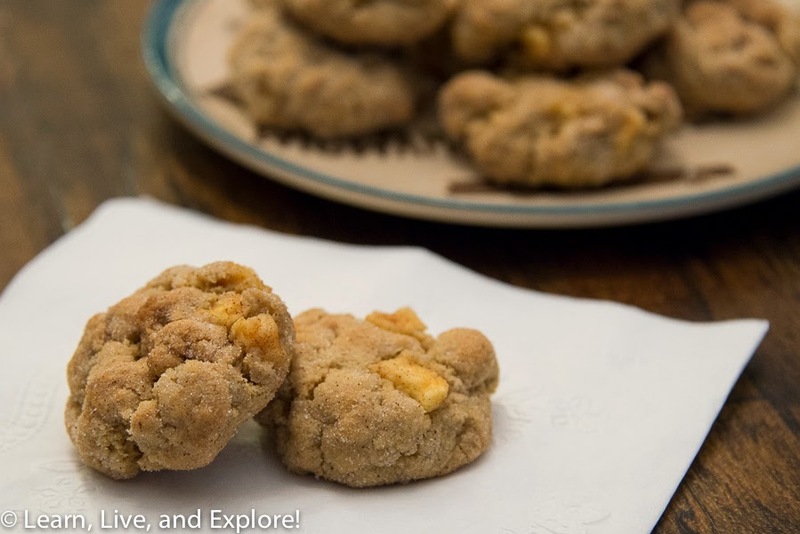 Take advantage of the fall apple harvest and make these soon! Oh, and try to eat these within a day because the moist apples impact the, already soft, cookie quickly. In an electric stand mixer, cream together the butter and two sugars. Add vanilla and egg and beat until smooth. In a separate bowl, combine flour, pudding powder, baking soda, cinnamon, salt, and nutmeg. Add dry ingredients to the wet, a little at a time, mixing until combined. Stir in apples and chill in the refrigerator for 1 hour. Preheat oven to 350 degrees F. and line baking sheets with parchment paper or silpat. Roll approximately 2 Tablespoons of dough into a ball. Roll the ball in the bowl of cinnamon and sugar until generously coated. Place coated dough balls on baking sheets and bake for 12-15 minutes. Allow cookies to cool on the baking sheet, as they will continue to bake while cooling.